» Check Out POPEYE AND FRIENDS OFFICIAL! Popeye > News > Entertainment > Check Out POPEYE AND FRIENDS OFFICIAL! The Gang’s All Here on YouTube! 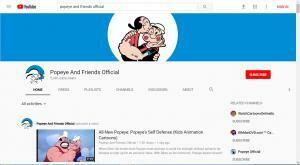 Have you visited the Official Popeye and Friends Channel on YouTube? Twice a week, new quick-draw Popeye AniMinutes are posted there as well as a cool selection of All-New Popeye cartoons – both in English and in Spanish. Popeye and Bluto, Olive Oyl and Wimpy, Swee’ Pea, Eugene the Jeep, Poopdeck Pappy and the Nephews – the entire gag is here and ready to make you laugh. Check out the cool content on the Official Popeye and Friends YouTube Channel – and learn why Popeye is one of the world’s most beloved characters of all time!